I'm very grateful for every reader AFB has, but recent research has discovered that some of you have landed here through rather bizarre means. 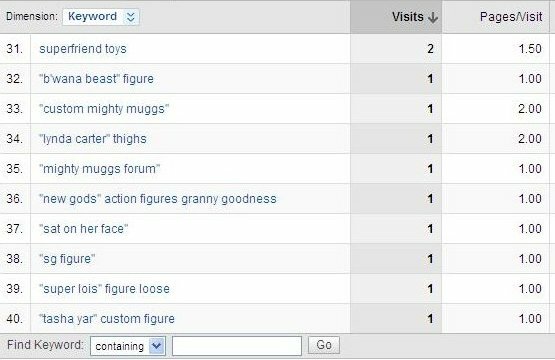 I use Google Analytics to keep track of the number of site visitors, what they're looking at and by what means people get to the site just for my own interest and to see what is most popular. The majority of readers arrive either direct through feeds or the URL, or through links from the sites I frequent and post my reviews at, however about 25% arrive through a search engine, some intentionally and some I would expect not so much. Looking at the breakdown of search terms for the current month, the #1 term is not so surprisingly "Action Figure Blues" followed by various derivations thereof. The next 25 or so are various toys or toy lines that people are searching for reviews on (Batman, Iron Man, DCUC and Mighty Muggs rank very highly). Yes folks, I'm pointing to #34, "Lynda Carter" thighs and #37, "sat on her face". Yikes! Naturally I had to work out where on earth these two terms exist on my blog, especially that last one, since I do try not to be too family un-friendly. A search for Lynda's thighs come up blank, both on the blog and on the web trying to find an AFB reference. No idea where that one came from or how it got here. For the record, I think Lynda Carter's thighs are nice. Well, when last I saw them. Anyway those two gave me enough of a giggle that I just felt I had to share. Some people and what they search for on the internet, right? But hey, whatever gets you here! It's a Mighty Muggs kind of day! The fantastic Lars, well known to readers of Toyfare and father of some of my favourite customs like my MA Liberty Belle , has turned hand to customising Mighty Muggs with amazing results. 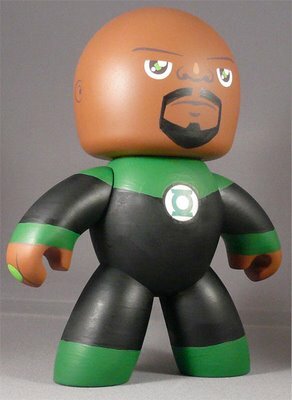 This John Stewart Green Lantern is all kinds of groovy and an excellent argument for why the DC Characters should get the MM treatment. (Sadly unlikely considering the Hasbro / Marvel alliance). The base could be one of the new blank Mighty Muggs that MM customisers are eating up, but it looks like a clever repaint of a Mace Windu MM to me. You can see more of Lars' work at his blog. ...or are they called Mighty Muggs even when there is only one? Anyway, have you seen this? 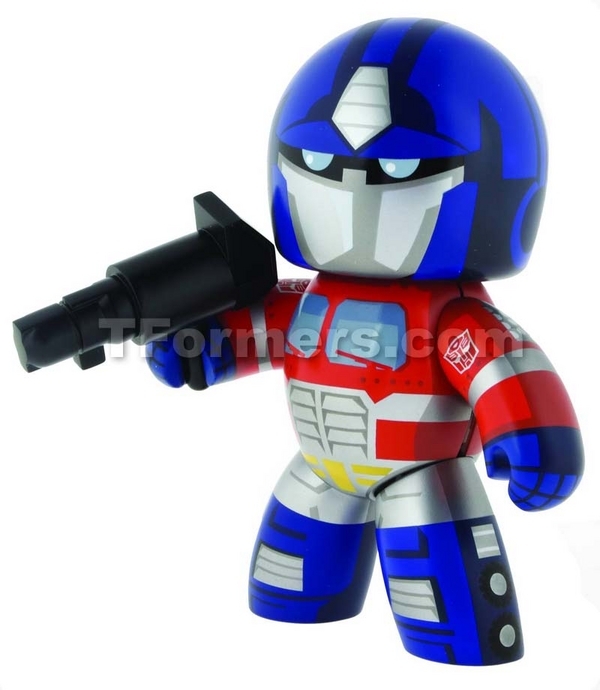 Transformers Mighty Muggs! Or.. Mugg. The teacher in me wont allow myself to make a plural sound for a single thing. Well, it's Optimus Prime anyway folks! I don't think this is brand new news, but I just caught up on it, and even though I'm not a huge Transformers fan (loved the recent flick but was never into it when it was first around - think I might have been a bit too old..) I think it's groovy. TNI has the info. He comes with his fusion cannon weapon, which I assume is a must since TNI is excited about it. If only life could be a bit easier by making Mighty Muggs available to Oz via Diamond. Some are around in retail, and thankfully Aussie online store Casefresh (great Aussie source of all things Hasbro) seems to be stocking the lot, but I really hate hunting for things. Having said that, this little Mugg / Muggs might be worth the effort! 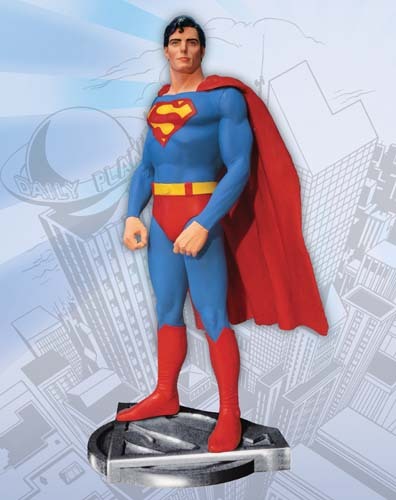 Where, oh where do I go to make sure I get my Vibe and Steel figures, in fact maybe more than one of each? And where is my Gypsy Mattel? 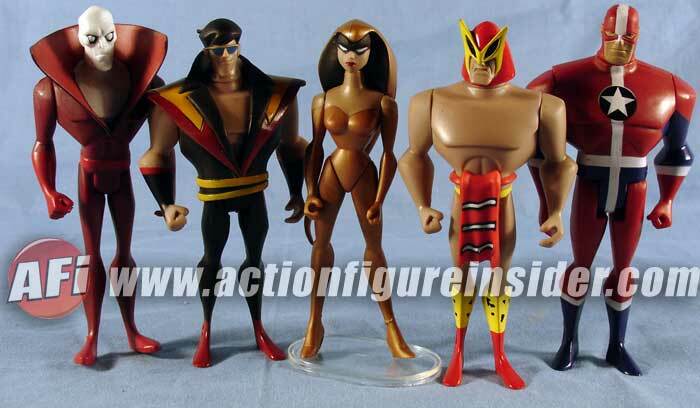 Great to see Mattel giving some plastic love to the Detroit League, and very impressed to see B'wana Beast and Crimson Fox make it to 3D as well. Check out the article at AFI for all the details. 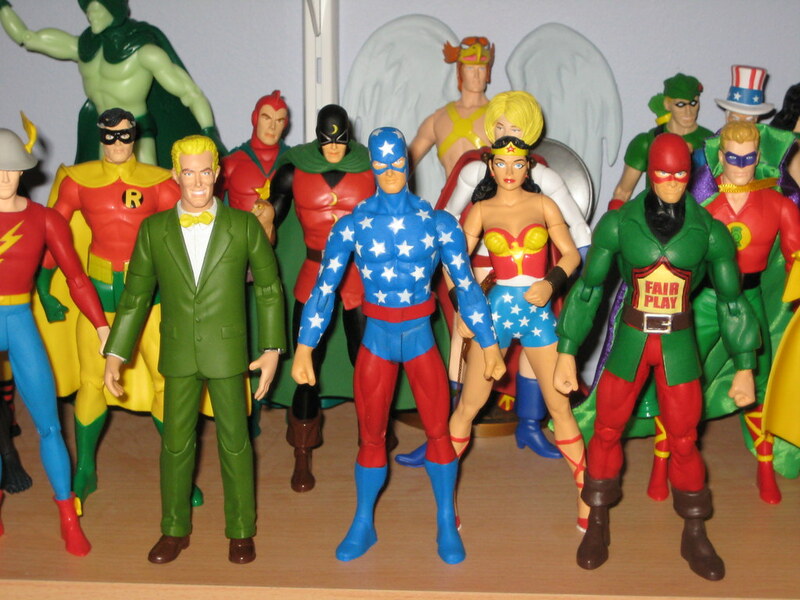 It's been awhile since I've had any new customs grace my shelves, but when I saw the amazing job that my friend rodkeith did with customs for Elastic Lad and Johnny Thunder, I knew I had to have my own, and was thrilled that he was nice enough to oblige! 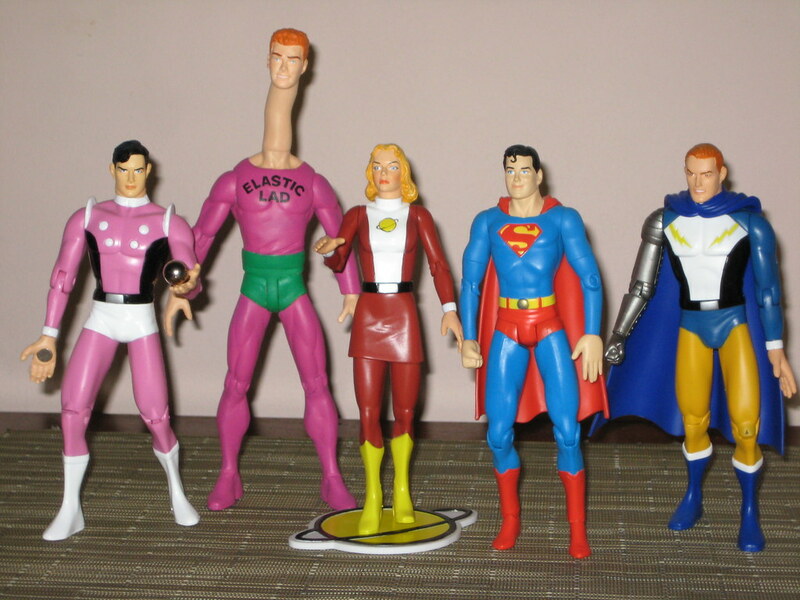 These fantastic looking pieces are actually a simple but clever headswap between the DCD Jimmy Olsen and JLA Elongated Man figures. 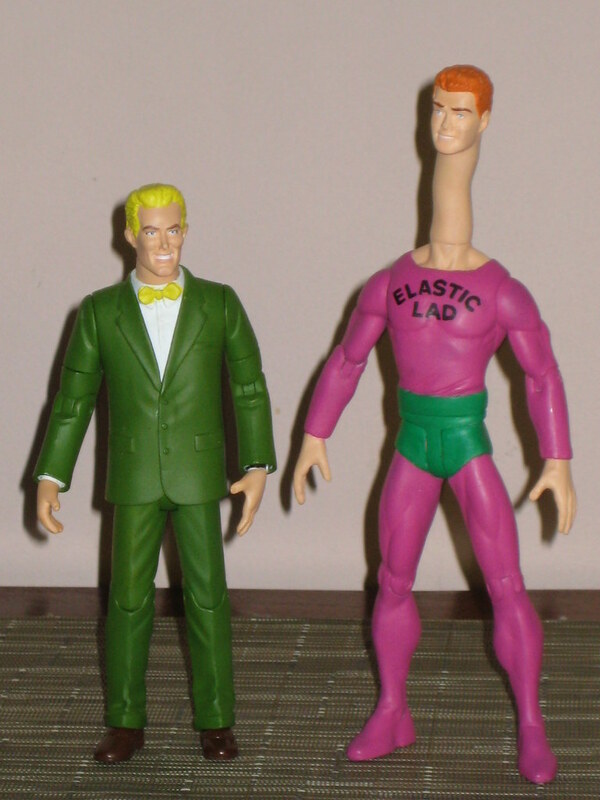 It's really very effective - puts a Jimmy head on a stretchy dude, and with a bit of shaving the Ralph head makes a very respectful Johnny Thunder. From the outstanding standard of the paint job on these figures, you'd never guess that they are from someone who has only recently started customising. They look just as smooth and clean in person as they do on screen. The lettering for Elastic Lad's chest emblem is unbelievable! 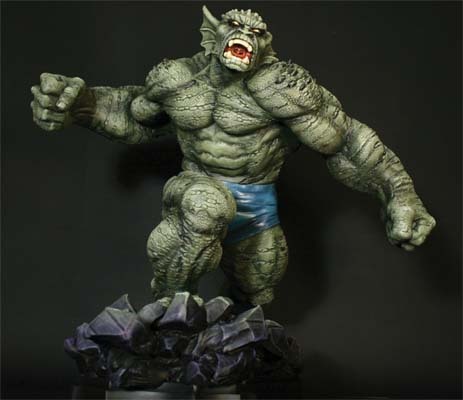 If you travel over to one of my favourite online hangouts, Critical Mess, you can see how these developed, and you can also check out rodkeiths utterly amazing Black Orchid custom as well! 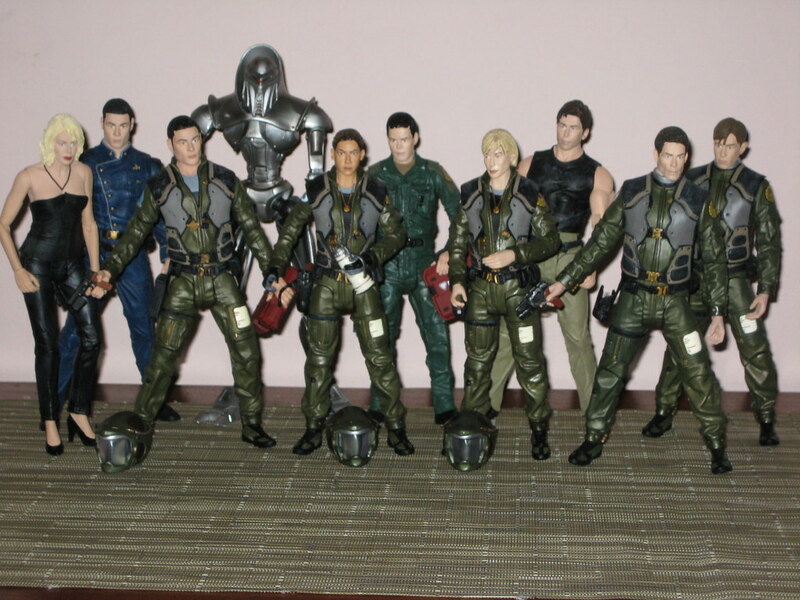 I Want: Battlestar Galactica Series 4 Action Figures includes Adama (finally! ), Roslin (finally!) and..... President Lee Adama? Glad to see that the headsculpts for Adama and Roslin are more spot-on than some previous waves, but sad to see that a spot that could have been taken by one of BSG's many deserving supporting characters has been filled by a basically one off version of a character that we're already getting two versions of. Hopefully this means there's alot of life left in the line, because I'm not leaving until I get my Tigh, Baltar, Cally and Gaeta, thank you. I Wish: Bowen Statues Abomination Statue is another amazing effort from Bowen Statues. Abomination isn't a character I'm going to break my bank for, but dang these are amazing. I also like collecting pictures of these things because it makes my humble purchases look more normal when I show this big babies to my wife. Everyone wins. 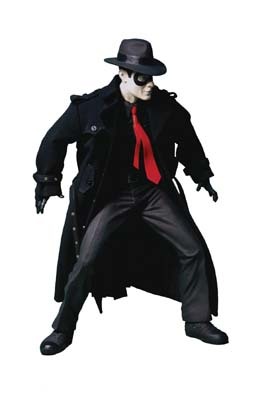 I Wish It Wasn't Real: The Spirit Movie 12" Figure - getting a movie figure before we get a comic-accurate figure, particularly after Cooke's excellent effort with this character? Frowns, everyone. Frowns, frowns. Oh plus, the dude looks like he's squatting to take a dump. Nothing is screaming winner here for me. I Wish I Could Have this for Christmas: Electronic Star Trek Tribble Toy. 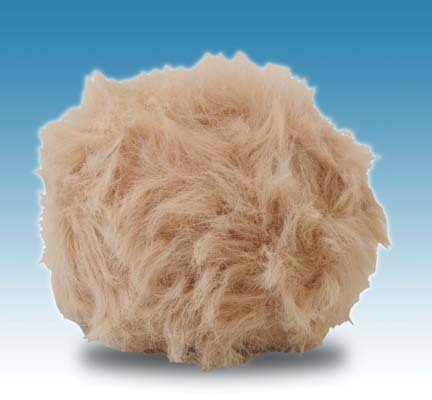 Come on, who doesn't want a noise-making Tribble!! One of the silliest but most memorable episodes of The Original Series is now this silly but memorable interactive toy. This definitely belongs on my novelty shelf in my office! 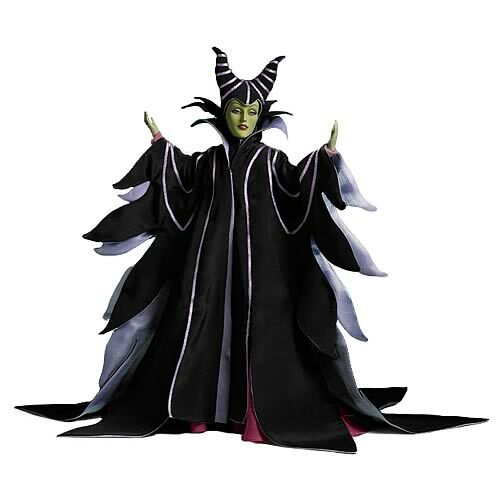 I Don't Know What To Wish About: The Tonner Dolls Malificent ...... thing. 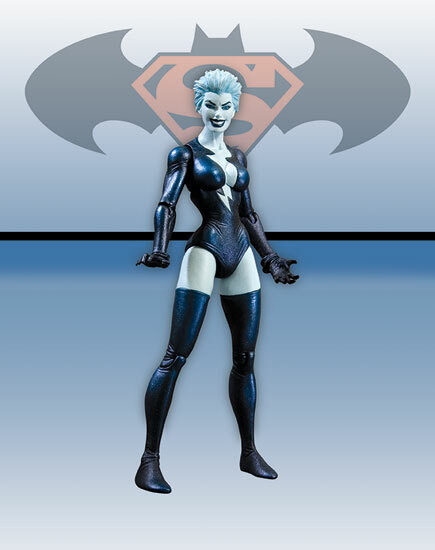 I know this doesn't fall into the realm of what most of us would be interested in, but I just thought it was worth putting this.. interesting creation here as a visual reminder that the same people who make the Tonner Superhero dolls make.... this. Enough said. Like I said, it was a bit of a catalogue of yawns this month. At least I'll be saving some money in a few months time! I've got a few posts backed up at the moment, and while it's school holidays here (school in Oz is broken up into four terms of 9-10 weeks each with a 2 or 3 week break in between each except for Summer (Dec-Jan) which is a much longer break) there's alot to be done around the house, and in a couple of days I'm on double Daddy-duty as Mrs AFB is going off for a work thing, so I'm going to try to teach the kids to garden so that I can catch up with all this toy stuff. Presently they are enthusiastically into weeding, but can't yet discriminate between between plants and weeds. Wish me luck. 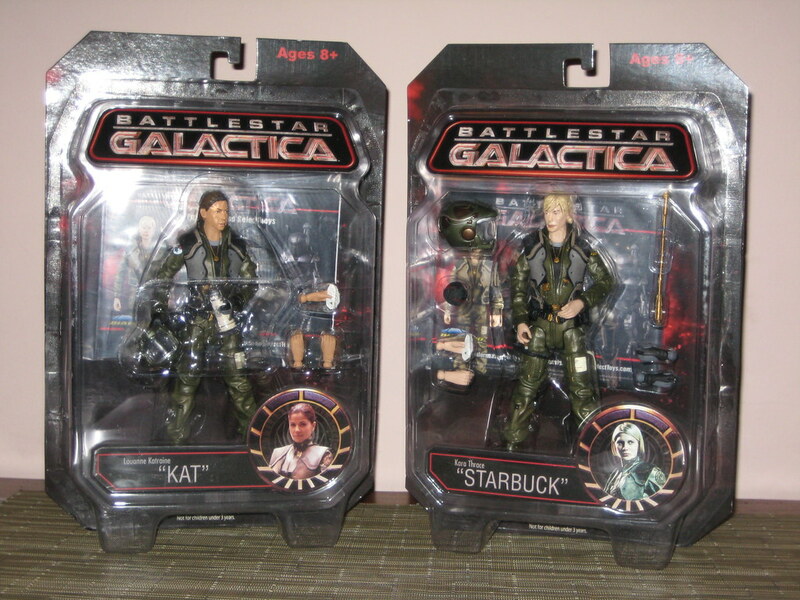 First cab off the rank of backed up toys is Series Two of the new Battlestar Galactica figures. This series features Starbuck, Kat, flight gear Helo and a non-blood-splattered Cylon (my blood-splattered Cylon just arrived today with my SDCC Exclusives, watch this space, but wasn't around at the time of photographing). The good: There is good consistency across the line so far, with everyone pretty much in scale (most accomplished by sharing body sculpts, but hey, whatever gets you there.) The pilot uniforms are particularly detailed. The figures are all easy to pose and stand well on their own. 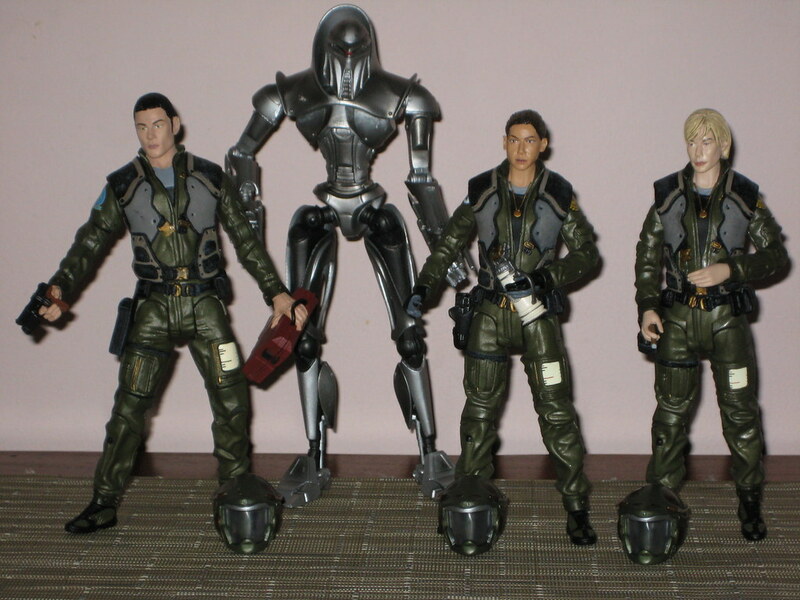 Each of the figures, even the Cylon, comes with extra sets of hands. I particularly like the hands with playing cards that Starbuck and Kat come with! Starbuck also comes with a cigar which is another fun accessory. 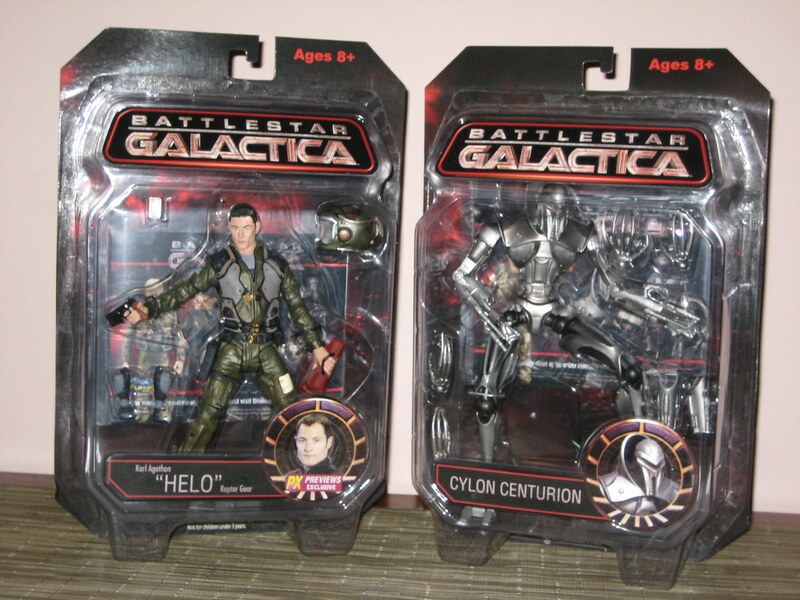 The Cylon figure is brilliant, although I did find it a little hard to get him/it to stand upright. It cuts an imposing figure above the other characters. The bad: with the amount that DST is saving by reusing bodies in this line, you'd think they could really pay attention to the headsculpts and make sure they're spot on. Kat is the best likeness here by far, and I'd put Helo up there too if he didn't have that vacant stare. 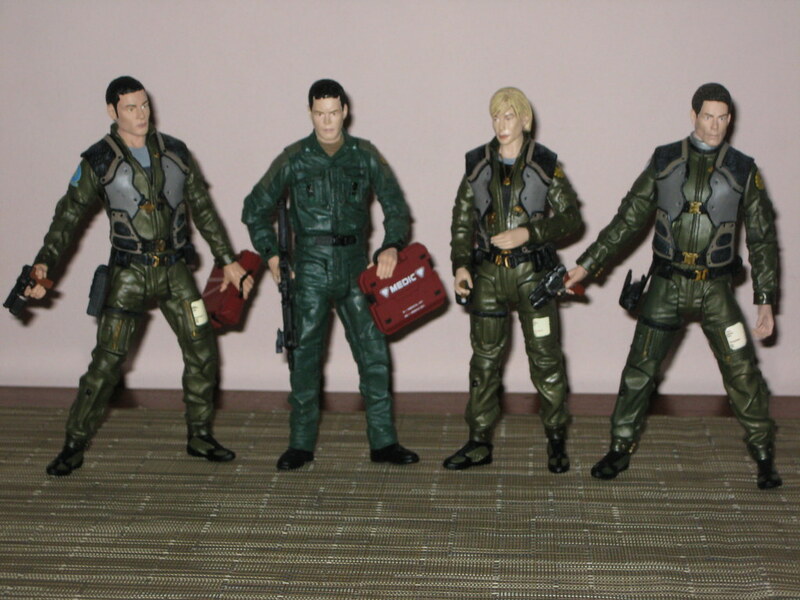 It's a shame that Starbuck, much like Apollo in the first wave, disappointingly misses the mark. It's encouraging to see that the sculpts for Adama and Roslin (Wave 4) look to be much more spot on, but it's a shame to have two of the biggest characters in the series practically unrecognisable. 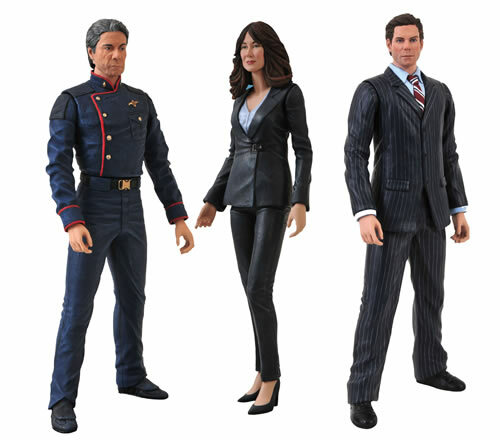 The range of characters covered so far in this series, including supporting characters like Hotdogs and Kat, speaks well for the future of the line, although "President Lee Adama" in Wave 4 seems like a bit of filler. I'm very hopeful for a Wave 5 consisting of Baltar, Tigh (with eyepatch variant) and perhaps Cally and Gaeta before we see this come to an end. I just hope I can recognise them.